With the hot summer months upon us, if you’re doing any form of exercising (which hopefully you are), consider these strategies for hydration and sports nutrition to help you get the most out of your workouts and for a healthier you. Regular exercise is an important part of health and fitness, but did you know that what you ate last night for dinner and for breakfast this morning can have a huge impact on the quality of your workout today? Proper hydration and sports nutrition will ensure your diet will efficiently fuel your workout routine and help optimize athletic performance. Here are the important pieces of a healthy training diet that supports athletic performance. The human body is made up of 60% water with fluids that help maintain normal body temperature and deliver energy and nutrients to hardworking muscles. An adult loses about 2 liters of fluid per day, and failure to replace these lost fluids raises the risk of dehydration. So it’s recommended at a minimum, to drink half of your body weight in ounces per day of water for proper hydration. Also, drink an additional 8 ounces of water for every 25 pounds carried above your ideal weight. It’s essential to stay hydrated so you can perform better and push through your workout. Here it is broken down to make sure you’re getting the fluids that your body needs. Pre-hydration begins with three cups of fluid in the hours leading up to your workout to assure normal levels with the goal to prevent dehydration from happening in the first place. During your workout, hydration with cool liquids early and often helps to prevent dehydration, electrolyte imbalances, and to minimize negative effects on athletic performance. 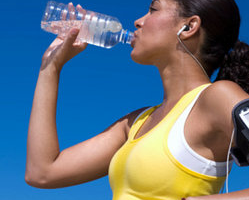 In hot and humid conditions, you should drink even more fluids for every 15 minutes that you exercise. If exercising exceeds 60 minutes, use a healthy sports drink like Performance that can replace both fluid and muscle glycogen stores. Re-hydration after your workout is important to enhance the recovery process. In the hours after exercise, try to re-hydrate with another two cups of fluid for every pound of weight lost during your workout. • Choosing complex carbohydrates is always a good choice with maximum health benefits. • Protein Is Essential: Protein is a must for increasing muscle mass and strength, as well as for recovering from prolonged exercise. I recommend this Non-GMO Protein. Try to consume a balanced intake of fluids and protein within 30 minutes of your workout routine to maximize hydration, muscle repair and rebuilding, and muscle and energy refueling. • Vitamins and Minerals: Since you can’t consume all the nutrients your body needs through the foods you’re eating, I recommend these Essential Vitamins & Minerals. Stay fit this summer with timing the consumption of food with proper sports nutrition and hydration before, throughout your exercise session, and after your workouts to significantly improve hydration, energy, and recovery.